Look, I know things haven't gone exactly to plan these last 2 years. A couple seasons without a bowl does a lot of strange things to a program...especially one as traditionally powerful as Michigan's. Eight wins in 2 years is not acceptable, we all know that. And it has left an impression on people's expectations for what 2010 could be. A decimated defense that wasn't all that good to begin with. An offense led by two sophomore QB's. There are question marks all over the place. But I like to look back at Michigan teams that ended up being pretty great by the end of the season, while not exactly being considered world-beaters when the season began. For example, the 1997 season is one I like to reference a lot. Expectations for that team were average. 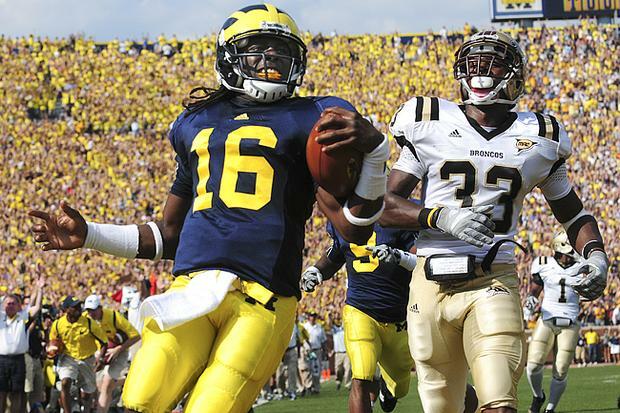 When the preseason rankings were released that August, Michigan was ranked 14th overall by the AP voters. That's a casual way of the pollsters saying, you're a powerhouse so we'll give you a comfy mid-teen ranking, but we don't expect anything great form you. By November 10th, we were ranked #1...and stayed there for the rest of the year. 2006 is also another great example of Michigan having to earn the respect of the pollsters. When the pre-season polls were released, they were ranked 14th again. 8 weeks, and 8 wins later, they were ranked #2 where they stayed until the season-ending loss in Columbus. 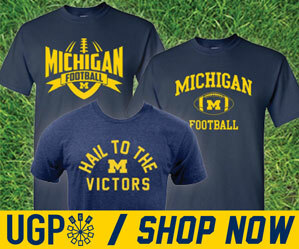 But even with that loss and the loss to USC in the Rose Bowl, Michigan still finished off the year ranked 8th overall. Not bad considering. On the flipside of that coin, there are years when Michigan starts the season ranked very high, only to disappoint and fall within the first 2 or 3 games of the year...and eventually they fall out of the polls altogether. See: 2005, 2007. In 2005, we began the season ranked all the way up to #4 in the AP poll. 5 losses and 12 weeks later, we were unranked and headed to a pre-New Years Day bowl. In 2007, we began the season ranked #5 in the AP poll, only to lose 2 straight miserable games to open the season and drop from the rankings immediately. Actually, we dropped from the rankings after week 1...but let's not go there. You could say that it was 2005 and 2007 were the reason's Lloyd Carr is no longer coaching today. But I'll take low pre-season expectations rather than lofty ones. So it's stands to reason that 2010 could be setting up nicely for the kind of year we like. Low expectations for Michigan usually mean higher than expected results by the end of the year. If Lloyd were still coach and we didn't have two miserable seasons in a row, based on the talent level of the players we have coming back (especially on offense) we'd likely be ranked in the mid-to-upper teens. But this is not Lloyd's team. This is Rodriguez's team. He has revamped and reconstructed this program over a two year period that has galvanized this team's fanbase. And apparently, galvanized the pollsters and experts as well. ESPN partnered with Blue Ribbon College Football Yearbook to provide a comprehensive preview of all 120 FBS teams for the 2010 season. [Link, team previews require Insider subscription] In this preview, they cover each team individually, provide a pre-season All-Conference squad, and rank the teams in each conference. As you could probably guess, Michigan is not favored to do much of anything according to this preview. They rank Michigan 7th in the Big Ten, and have no Wolverines in the All-Big Ten team. But to me, this seems about right. I don't contest these pre-season projections. Mainly because they are based on the previous season's outcomes, and we all know how Michigan fared in October and November last year. But I have to think that this sets Michigan up as maybe the biggest and most interesting surprises for the 2010 season. Odds are we'll have a winning record. Our OL and skill positions are way ahead of where we were last year. And I don't think the defense is going to take a hit from losing Graham, Brown and Warren. In fact, I think the defense will actually improve overall. I can think of no other team in the Big Ten that has such low expectations, and yet so much talent. If Rodriguez can rally this team together and get the season started on the right track, I have no doubt we can be the biggest sleeper not only in the Big Ten, but perhaps all of college football. I'm not trying to say that 2010 could be like 1997 or 2006, but measured improvement is all we're looking for. Whatever it takes to get back to respectability and keep Rodriguez here for a 4th year...that's all I ask. And if we can surprise some teams along the way...even better. I think you're onto something. We are a talented team with athletes and speed at the skill positions and a strong OL and DL. We also have 2 long time starters at LB. Everyone is assuming we will field the same team that we had last year, with the same results, while everyone we play gets the benefit of the doubt that the have improved since last year. I hope your right. The only thing that scares me is that Greg Robinson never ran a 3-3-5 defense before. If he knows what he is doing then there is huge opportunity to do very well. As long as we get momentum going right off the bat against uconn. Think of this too, how many games would we of won with no turnovers.